Improving access to justice at the national level in a conflict/post-conflict setting requires long-term commitment on the part of all stakeholders. Those within the legal/justice sector must coordinate amongst themselves as well as engage with actors in other sectors to protect and promote the rights and needs of survivors. Facilitating justice sector interventions should never be seen as a stand-alone activity, but rather part of a larger framework for multi-sectoral response. Dearth of laws and policies protecting survivors. No functioning police force, courts or survivor advocates. Pursuing prosecution may put survivors at greater risk of violence due to lack of protections from the perpetrator, his family and the community. Victims/witnesses may not appear for scheduled court appearances due to lack of information, lack of subpoenas, witness intimidation, lack or transportation, childcare responsibilities, re-victimization in court, or any number of other factors; cases may be dismissed or repeatedly postponed if witnesses are not present. Absence of court staff or insufficient knowledge among judges and lawyers of laws/policies related to VAWG may result in cases being mishandled or dismissed. Insufficient resources for legal systems may result in long delays in legal processes for any type of criminal matter; in cases of VAWG, victims are likely to become discouraged and (especially without adequate emotional support and legal support) withdraw their participation in the proceedings. VAWG may not be prioritized among other conflict-related atrocities. (adapted from UNDP, 2010). Budgetary support: Financial and in-kind support that is officially designated to the institutions (UNODC and United States Institute of Peace, 2011, p. 21). Some useful questions are listed below to help guide an assessment of the legal/justice sector. 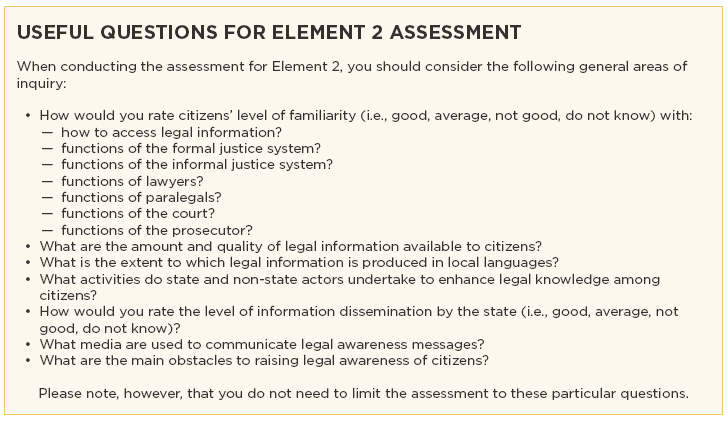 These questions are directly applicable to assessing access to justice, are applicable to both state and non-state mechanisms, and can be adapted to focus specifically on the capacity of the legal/justice sector to address VAWG. The questions are divided according to 6 key topics, or ‘elements’: Legal Framework, Legal Knowledge, Advice and Representation, Access to a Justice Institution, Fair Procedure, and Enforceable Solution (American Bar Association, 2012). Excerpted from American Bar Association. 2012. Rule of Law Initiative’s Access to Justice Assessment Tool, pp. 7-40. Establishing a strong legal and policy framework, which mandates the sector to address violence against women and girls. Developing institutional capacities of justice/legal sector institutions and competencies of personnel. Improving service delivery to survivors of violence and women and girls at risk. Establishing governance and oversight mechanisms that hold the sector accountable. For more information on access to justice assessments see American Bar Association, Rule of Law Initiative. 2012. “Access to Justice Assessment Tool. A guide to analysing access to justice for civil society organizations.” This manual is a comprehensive guide to access to justice research for novice and experienced researchers. It concentrates on explaining the basic skills and concepts necessary for research to be useful and reliable. Available in English. Another example of a thorough assessment tool can also be found at: Bureau for International Narcotics and Law Enforcement Affairs, United States Department of State. No date. “Criminal Justice Sector Assessment Rating Tool. A U.S. Government Inter-agency Project to Assess the Capacity of International Criminal Justice Systems.” Available in English. The situational analysis tool by in the Gender-based Violence Tools Manual for Assessment & Program Design, Monitoring and Evaluation (RHRC, 2004) includes basic assessment questions for the legal/justice sector: Available in English. Gender-Based Violence in Southern Sudan: Justice for Women Long Overdue. (Allard K. and Lowenstein International Human Rights Clinic at Yale Law School. No date.) A Study for the Enough Project that examines the extent and sources of gender-based violence in southern Sudan and analyzes the ability of survivors of violence to secure justice. Available in English.